Golden Productions is your go-to source for event entertainment, whether it be a wedding, mitzvah, or corporate affair. Neil Goldberg founded the company in 1988 and has been providing DJs, KJs, VJs, Professional Hosts and emcees for all types of parties. You name it, he’s got it. 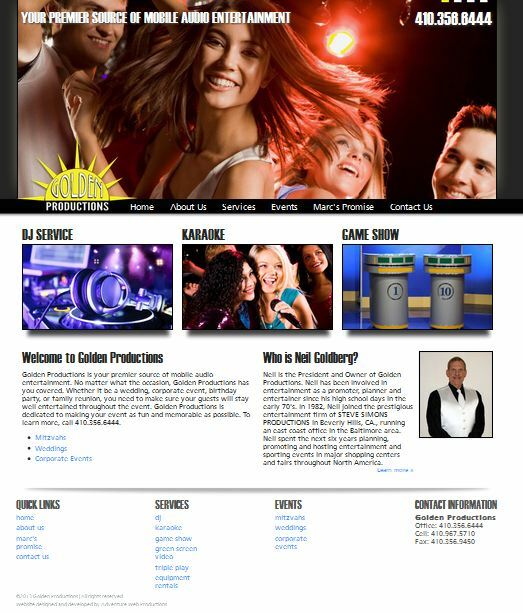 Golden Productions has recently joined ventures with a few local companies and can now provide Casinos, MTV Videos, Virtual Reality, Midway rides and games, Carnival games, décor, tables and chairs and more. Strut your stuff and belt it out with Golden Productions Karaoke. Choose from over 140,000 songs and enjoy the free DJ service along with your Karaoke event. Choose a game show event for your office and battle it out to see what team will be victorious. In a wedding setting, pick from live music, a dj, or soft background music. Golden Productions has a few young stallions that are up for the challenge of a modern, light-hearted wedding as well as DJs to fit the music taste of an older generation. For more information on booking your next event with swag, visit the new site at http://www.goldprousa.com.